Motherhood is a blessing. At the same time, It is nothing short of a roller-coaster of emotions and challenges. Many new mothers face many challenges and problems with going back to work after maternity leave - the first phase of the parenthood journey. Motherhood is a blessing. For the majority of women, motherhood is nothing short of a roller-coaster of emotions and challenges. It comes with its share of pleasures and aches. The maternity leave is kind of the first phase of your parenthood journey. Many new mothers face many challenges and problems with going back to work after maternity leave. In this post, we will look at the 8 Tips for Going Back to Work After Maternity Leave. Being with your baby at home all day long makes you happy. For the working women, it is even more emotionally wrenching. More often than not, there is always a doubt of coming back to work post maternity leave. Work life seems like a blurred memory. Coming back to work after a long maternity leave can give you a panic attack. It’s very normal to feel overwhelmed due to the crashing of pregnancy hormones in your body. You might be returning to the same company after a 12-weeks leave, a 6-months break, or planning to revamp your career after 2 – 3 years career gap. This post on 8 Tips for Returning to Work After Maternity Leave will help you to get back on the road. This is a case of the majority of Moms. You have to get rid of it. Millions of working mothers are managing to raise amazing kids. Don’t be hard on yourself. You deserve to have a career. You just need to be organized – which comes naturally to all the Mothers around the world. Remember why you are working. You might want to be financially more independent, have your own identity in the professional world, or share the household expenses with your significant half. Whatever the reason is, that’s going to be beneficial for you and your family (including your kid’s future) in the long-term. S/he may even be better off because of your career. Don’t believe me? Read this Harvard Study – Kids of working moms are better off! Get in touch with your employer beforehand and discuss the flexibility – timings or work from home options. You could also get started as a part-time employee for the initial few months. That will really help you to get settled down during this transition phase. Remember, the first few weeks or months back is going to be the hardest. I would really recommend this if you are joining the same workplace after your maternity leave. Catching up over a cup of coffee or having a casual lunch with your manager and/or colleagues a few weeks prior to return to work can be really helpful. This will give you an excellent opportunity to catch up on the office gossip, updates on the new projects, and what’s going on in everyone’s lives. Catching up on what’s going on at work and what projects await you will cut down on pre-first-day anxiety. So, you will really start to feel re-engaged with work. Legally, you are entitled to return to the exact same job position you were working on before your maternity leave. If your employer refuses to revert your position and job scope, be aware of your legal rights; don’t be afraid to seek legal help. Alternatively, speak to your employer; analyze the alternative role in detail and assess the circumstances. According to a study by the World Bank in collaboration with the National Sample Survey Organisation, 20 million Indian women quit jobs between 2004 and 2012. Around 65-70% of women who quit never return to work at all. Besides, the pay cut issue is also there. Plan your break carefully by setting yourself an end date and having back up plans in place. Networking is one of the most important tools you can arm yourself with when taking a sabbatical. A strong support system of colleagues and professional contacts can smoothen your way back to the position you left behind. When you are ‘between jobs’, it is crucial to do everything to stay up to date with what is happening in your line of work. Take online courses; especially those involving capstone projects. Join discussion forums, do research and keep learning. Continuous learning is always beneficial irrespective of your career stage. Worried about Returning to Work After Maternity Leave? Explore the hottest online courses for career development and the current job market. If your profile allows it, take up freelance projects. Even if the remuneration is low, don’t worry. After all, you will have something to show during your career gap. We all know how important the online presence in today’s competitive job market is. You could treat motherhood as the real job that it is (at least on LinkedIn) and clearly state the reason for taking a career pause; thanks to The Pregnancy Pause. This is the big one. You can start on it even before your child is born. Finding childcare you can trust is half the battle won. Choosing the right childcare is a major concern for most working parents. Flexibility, availability, and costs can vary quite dramatically. It is extremely important that you have all the essentials in place before you return to work. You’re back in the world right after a huge transition. If you’re prepared, things will be easier and definitely less embarrassing. 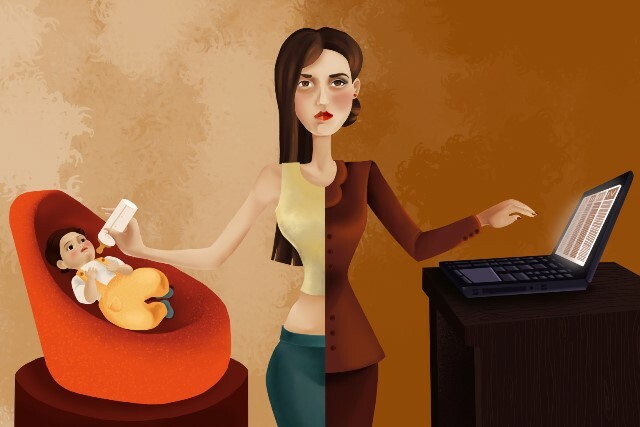 Having both feet in two different worlds can be quite a daunting affair for a new mother, especially in the professional (or corporate) setting where not only the work but social pressure to perform is high. Worried about Returning to Work After Maternity Leave? Don’t be too afraid to take it at your own pace and find the right balance between work and family, with the support of your spouse and colleagues of course! We live in the 21st Century and there is no reason why motherhood should impede you from achieving excellence in your professional careers. Tanmoy Ray is a blogger, content marketer, and admission counselor & career adviser. Tanmoy is from Biomedical Science & Pharmacology background. He has worked at the University of Oxford (UK), Utrecht University (Netherlands) and University of New South Wales (Australia). He is currently with Stoodnt & Careerizma as Study Abroad Counselor & Career Adviser, and Freelance Blogger & Digital Marketer. When he is not working, he would be traveling, cooking, following movies, sports & music, or taking candid photographs.